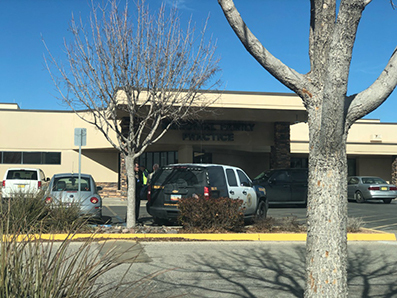 The man who prompted two lockdowns Wednesday afternoon at Artesia General Hospital was arrested Wednesday evening in Roswell on unrelated warrants. Artesia Police Department officers was initially dispatched to AGH at 12:44 p.m. Wednesday in reference to potential threats issued to the hospital by telephone. That lockdown was lifted at 1:51 p.m.; however, a second was initiated at 2:58 p.m. At that time, employees were instructed to stay away from windows and seek shelter. No incident occurred, and employees were released from lockdown around 4 p.m.
Cmdr. Lindell Smith of the APD says the male suspect may have experienced a “loss of reality, control or perspective episode” that prompted him to leave phone messages for at least one clinic at AGH. Officers were able to listen to the message, but Smith says they were unclear and difficult to hear. APD will be following up with the hospital and the male individual, who has yet to be identified but was arrested Wednesday evening in Roswell on unrelated warrants. “Much of the issue from yesterday is connected to the male subject’s medical issues, many of the details of which are not releasable due to privacy laws,” Smith said.